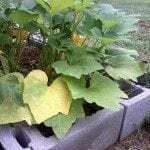 We have beautiful zucchini and yellow squash plants; however, we will only have maybe two vegetables from the plants. The plants continue to be beautiful, so no issues with the borer worm. Any idea what our problem is?